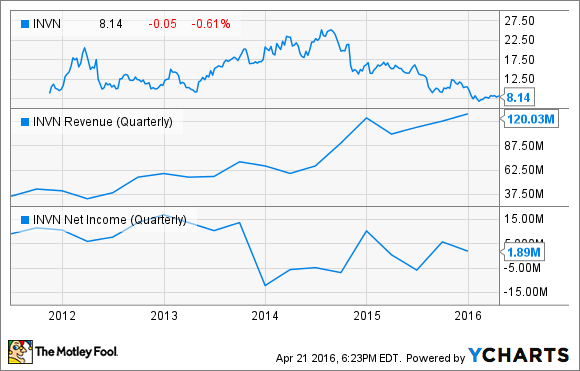 Is Now the Time to Buy InvenSense, Inc.? The stock is down, but the future looks bright. Remember the summer of 2014 when shares of Internet of Things chipmaker InvenSense (NYSE:INVN) were over $25 per share? Fast-forward to today, and you'll find shares trading around a paltry $8. Surely a bargain is to be had, right? Let's dig in and take a look. First, a little background on the company's decline. When wearable technology and other Internet of Things tech first hit the market, the sky seemed to be the limit for InvenSense. The company had the market cornered on smartwatch motion sensors and was a major chip supplier for Apple (NASDAQ:AAPL) and Samsung (NASDAQOTH:SSNLF) smartphones as well. But competition heated up and makers of wearables started to diversify. Sales growth and earnings at InvenSense started to come in below expectations, and as that reality set in, shares took a tumble. Other than a share price that has recently plumbed all-time lows, the picture for the chipmaker could be a lot worse. Sales have continued to climb, and while earnings have gotten volatile as of late, the company is still profitable on an annualized basis. As far as outlook goes, you would be hard-pressed to find any positive news. The company's management has issued soft guidance as smartphone purchases worldwide start to slow, and competition among chipmakers for the existing market of IoT devices is fierce. Analysts see FY17 revenue dropping by almost 4% and earnings dropping by over 6%. Investors will no doubt be waiting to see where management guides financials for the new fiscal year, and whether that guidance exceeds the current downbeat feelings on the Street. InvenSense is scheduled to report Q4 earnings on May 9. With share prices wallowing on all the negative PR, should investors call a bottom here and buy in? Let's look at a few valuation metrics and compare them with those of InvenSense's industry. Chart data source: Yahoo! Finance. The math demonstrates the rough 12-month period InvenSense has had. Price to sales, a measure of stock price to total revenue, has dropped below the industry average as a result of the stock drop, and price to earnings is ugly, as company profit has dropped more steeply than share prices. The picture going forward looks a little more optimistic, though. Forward price to earnings cleans up and is only a little higher than the industry average, and five-year earnings growth estimates exceed the industry. As a result, the PEG ratio, which measures the premium paid for future growth outlook, is in line with peers. These figures indicate to me that InvenSense is currently fairly valued, but these numbers could change after we get guidance from the company during the earnings release on May 9. Ignoring short-term thinking and expectations, however, the company is expected to outperform as far as growth in the years to come. Company management plans to execute its growth strategy by diversifying away from smartphones. The company has invested so that its technology now has applications for wearable tech such as watches and cameras, drones, and automobiles. New sensory technology has also been developed for microphone applications, environment detection, and fingerprint reading. InvenSense hopes these investments will help diversify the business, not just across various technology applications, but also by geographical and end-client sales. InvenSense demonstrates its motion sensing technology. Image credit: InvenSense. The fruits of this labor are starting to be seen. The company recently announced a new deal for use of one of its microphones with Gionee, a Chinese smartphone manufacturer. The company has also rolled out six new video and audio systems for use across multiple applications, as well as the company's first software service, Coursa Retail, since the first of the year. Could there be more drop left in InvenSense's stock? Sure, but that depends on any forward outlook changes in coming months. Is the stock a value? It looks to me like it's approaching that point if it isn't already, especially when considering the five-year growth potential. For those willing to be patient, I think it's worth the wait as the company diversifies its product mix and rides the growing IoT wave.